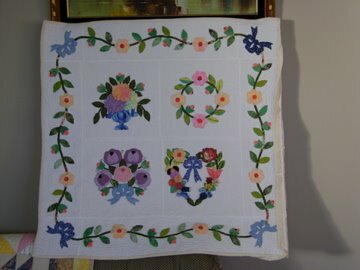 JUSTELLA'S GRANDMA Quilting, more quilting & Grandchildren. Well there hasn't been much quilting going on this week. And I have just spent most of Saturday & Sunday up at the Golf club processing the cards for the Wanganui 72 Mens Open Tournament. It was won by Riki Kauika a local lad he was 8 shots ahead of the rest of the field. 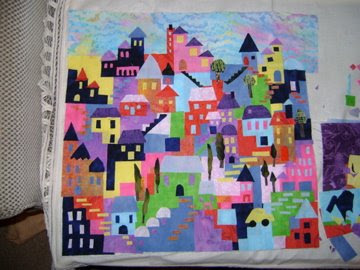 Thought I would show you may Happy Villages quilt it isn't quite finished yet. I still have the quilting to do on it. I have covered it with a black tulle. There is a lot of quilting to do, very fiddly. I don't know that I would make another one.